Beat the heat and spritz yourself with vital energy with Primavera Toscana Beauty Water. Italians keep their beauty water in the fridge to keep it chilled what a great idea! 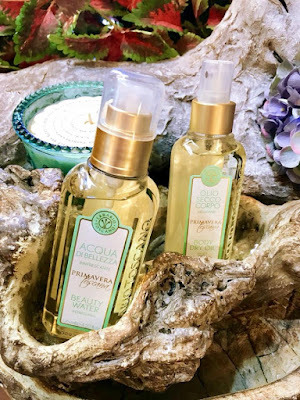 This scent is filled with the freshness of citrus, the sweetness of flowers, the bouquets of wild herbs, and the energy of woods and the moisturizing properties of precious essential oils. With this Tuscan Spring line, the skin regains a fresh and radiant vitality. Made in Italy.